JERRY'S BEST BETS : Saturday 21st June Royal Ascot Day five . Saturday 21st June Royal Ascot Day five . 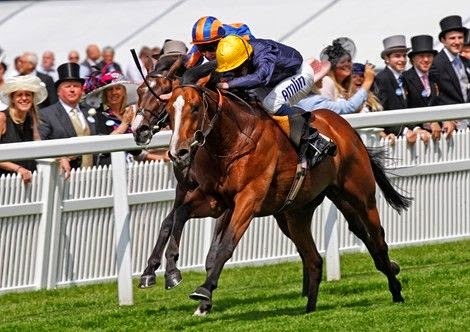 10 runners declared for Hardwicke Stakes over 1 mile 4 furlongs .This looks cracking group two contest with the three main contenders : Forgotten Voice , Hillstar & Telescope . FORGOTTEN VOICE :Useful dual purpose nine year old gelding, winning 6 out 20 on the flat .won twice last season ,including the G3 Glorious Stakes at Goodwood in August .Also won at Royal Ascot winning the Listed Wolferton stakes over 10 furlongs .Finished good second last time behind Mount Athos in Listed race at Newbury .This looks much stronger race ,though goes well here at Ascot and has each-way claims . HILLSTAR :Progressive three year old last season winning G2 King Edward V11 stakes at Royal Ascot over C&D and then finishing excellent third in G1 King George at Ascot ,behind the useful German colt Novellist.Finished well beaten second last time behind Brown Panther in Ormonde Stakes at Chester ,though looked unsuited by soft ground .Should go well returning to Ascot on fast ground . VERDICT : Interesting race with Sir Michael Stoute having two live contenders .Telescope will be popular here with Ryan Moore aboard and looks to have ideal conditions,though will still need to improve to take this group two contest .Has to be respected ,though odds around 9-4 look little short. HILLSTAR'S third in last season's group one King George over C&D is best form on offer here and can bounce back to form with ground conditions in his favour.Goes well here at Ascot and should go close .Odds around 9-2 look fair value .